With summer in full swing, and temperatures rising, it’s important to stay hydrated during activity. Here is some helpful tips and information. Our bodies are comprised of 50-75% water, and when we are physically active (especially in warm, sunny environments) sweat is produced and some of our body’s water is lost through evaporation. It is important that we replace the fluids we lose through activity, and drink enough to keep our bodies hydrated. When we become dehydrated, our risk increases for heat illnesses such as heat exhaustion or heat stroke. Being properly hydrated means having an adequate intake of fluids before participation in sports, as well as replacing fluids and electrolytes during and after participation. An easy way to monitor your hydration status is by urine color. If the urine is not a light yellow color, hydration is necessary. To stay hydrated and avoid the complications of dehydration, it is important to recognize the signs and take steps to avoid it. Perhaps you have heard that the rule for staying hydrated is “8 cups of water a day,” and while this is a good place to start, if you are going to engage in sport outdoors, that isn’t going to be enough. 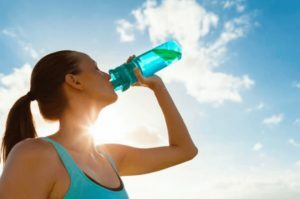 Guidelines to help you stay hydrated while playing sports can be broken down into three categories: before exercise, during exercise, and after exercise. Before exercise, start by following the “2 by 2” rule, which means drinking 2 cups of water 2 hours before activity, then drink an additional cup 10-20 minutes before activity. During exercise, aim for ½-1 cup of fluids every 10-20 minutes. A recommendation for post-exercise would be to drink 3-4 cups of water over the span of 2-6 hours. Be sure you watch the color of your urine. Water is very important, but when we sweat we lose electrolytes, so drinking Gatorade or other electrolyte drinks can be very beneficial. Have an enjoyable summer outside, and use these tips to help you stay safe and healthy while you’re at it! Alesha Carpenter is a Certified Athletic Trainer working in partnership with Exodus Health Care and Advanced Motion Physical Therapy to provide medical coverage for sports programs at Cyprus High School.